The following Mirror Sites List is always updated automatically and periodically. Each IP address may daily vary. Please visit this web site to obtain the latest list of the Mirror Sites periodically. The following list is provided for public. If you are a citizen of the country which has a government's firewall with unknown error which prevents accesses to the www.vpngate.net from the domestic Internet, please access to the Mirror Sites List page, copy the URL list and paste it to SNS, Blogs or community forums in your country to help VPN users in your country. This VPN Gate Web Site (www.vpngate.net) is a very beneficial site. It provides the list of Public VPN Relay Servers, and the guide how to connect to them. We believe that VPN technologies will realize huge benefits to every Internet users. However, there are some countries or regions which has a government's firewall on the border between domestic and international. It is said that such a firewall sometimes occurs communication trouble with unknown error. In such an event, some overseas web sites become unstable to browse from the country. It is very inconvenient for citizens in such a country if they cannot visit www.vpngate.net web site stably. In order to mitigate the above inconveniences, and help Internet users in such a country or region, we are providing a lot of Mirror Sites of www.vpngate.net. A Mirror Site is a copy of the contents of www.vpngate.net. If the access to the original (primary) server of www.vpngate.net fails, you can try to connect to one of these Mirror Sites. A Mirror Site provides the same contents as the primary server. You can also download the latest version of VPN Gate Client on a Mirror Site. 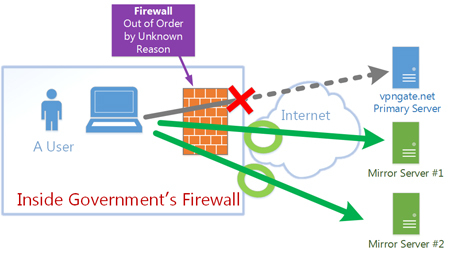 Are you behind the Government's Firewall which is under something unknown error to disturb your access to this https://www.vpngate.net/ web site? If so, VPN Gate Daily Mirror URLs Mail helps you. After you subscribe the VPN Gate Daily Mirror URLs Mail, the VPN Gate mailing server will send you e-mails with mirror URLs of VPN Gate periodically. Need daily e-mail notices with the mirror URLs list? Join VPN Gate Daily Mirror URLs Mail Subscription here.